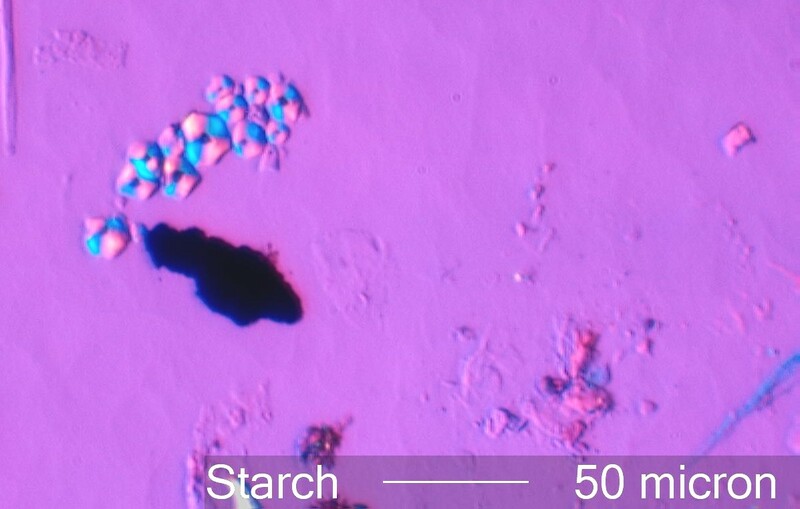 This is a cluster of corn starch grains viewed with crossed linear polarized light and a red plate compensator. The quadrants evident without the compensator plate change to either yellow or blue. For starch grains the blue is always in the upper right and the lower left (Cartesian Quadrants 1 and 3). The upper left and lower right turn yellow (Cartesian Quadrants 2 and 4). The structures around the pores in wood that look similar to starch grains in crossed polarized light will turn blue in the upper left and lower right (Cartesian Quadrants 2 and 4) and yellow in the upper right and lower left, the opposite of a starch grain.